Wholesale, on-peak electricity prices were up across the nation from 2012 to 2013, driven largely by increases in spot natural gas prices. Percentage increases in power prices were highest in the Pacific Northwest and New England, based on regional supply and demand issues in those markets. Electricity in the Pacific Northwest is typically among the least expensive in the nation because of the regional concentration of hydroelectric generation, which has a very low operating cost. The spring of 2013 was drier than the previous two springs in the Pacific Northwest, which kept wholesale power prices in the region from dropping to the levels seen in 2012. Colder-than-normal temperatures in December led to short-term spikes in both the natural gas and power markets in the region. 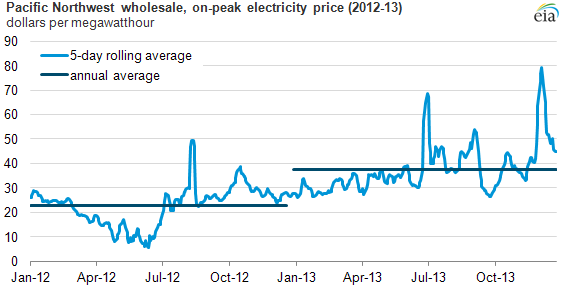 About 5% of the increase in wholesale power prices between 2012 and 2013 is attributable to the December price spike (see chart below). 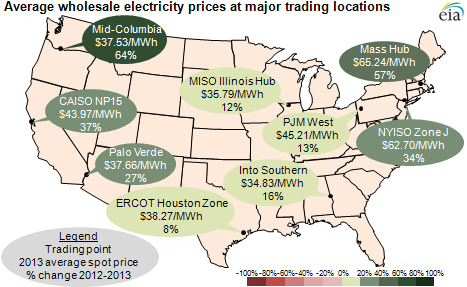 Note: Price data are for Mid-Columbia day-ahead, onpeak power price. In New England, cold weather taxed the already strained natural gas pipeline infrastructure, leading to day-ahead power prices in excess of $200 per megawatthour in January and February 2013 (see chart below). Cold weather in late November and early December led to a second spike in both the natural gas and power markets in New England. Note: Price data are for Massachusetts Hub day-ahead, onpeak power price. Elsewhere, a cooler-than-normal August kept power prices low in Texas in 2013, the area with the lowest increase in average wholesale, on-peak electric power prices compared to 2012. Most of the other wholesale power markets in the country had higher electricity prices in 2013 as natural gas prices generally increased from the sub-$3 per million British thermal unit levels of April 2012. For example, the power price at PJM West in the Mid-Atlantic region increased 14% while the natural gas price in that region (Transco Leidy Hub) increased 11%.